Ever since I first learned about it, I had always thought about taking up yoga. I wanted to improve my mind-body connection, as well as reap the fitness benefits of the practice. For several months, however, thinking about yoga was as far as I got. I had no previous knowledge or experience of it, and merely nursed my admiration for it via health and fitness magazines. It wasn't until a neighbor invited me to a Vinyasa class that I finally stepped into this new world of consciousness. Like many beginner yoga students, it took at least a couple weeks of classes before I stopped looking at others for clues as to what was meant by “Chaturanga.” I wondered how ridiculous I looked in various poses, thinking for sure that when the instructor suggested a modification, it was meant for me alone. Following the breathing cues felt like trying to write with my left hand, and after five minutes in “Savasana,” I was convinced we were left in the dark to fend for ourselves. It wasn't too long before my awkward body movements started resembling yoga poses, before I began feeling the ebb and flow of energy and strength in my body. I have been practicing yoga for just over a year now, and have come to a set of truths that I want to share with all beginner yogis. 1. Go your own pace. This takes patience, and sometimes, a certain level of resistance. Don't try too hard to keep up with the class (or with the YouTube video you may be practicing with). You are not falling behind by going slower; rather, you are building your own steady foundation for a stronger, deeper practice. Sometimes it takes a while to find the rhythm, to follow the language of yoga, and to bring your body through the movements. This process of going your own pace will allow you to efficiently build physical strength in the body, boost confidence in the mind, and create happiness all around. 2. 10-minute practices DO make a difference! This is one truth that took me a long time to learn and implement in my life. Why, for some reason, do we find it more difficult to commit to a 10-minute yoga practice than we do committing to a 45-minute yoga practice? Perhaps we think a short practice isn't enough to bring the body and mind to a state of peace and simplicity. I have found in my own practice that short yoga sessions is just enough for a good stretch, some detox-action, and clearing of the mind—making room for clarity, positivity, and productivity. Sometimes, it's just what I need on a busy day between a late dinner and an early bedtime. 3. It's about the journey, not the destination. I initially hesitated using this quote because we've all heard this one many times before, and honestly, it sounds like old news. Still, it is a wise truth that I have experienced again and again through yoga. Many of us have goals of achieving certain poses or asanas in our practice. Dreams of sitting into a split or forming a beautifully round wheel can seem far in the future. While it is true that "practice makes perfect," it is important to resist focusing too intently on the outcome. This type of impatience can leave behind feelings of self-doubt and frustration. Instead, focus on developing a well-rounded practice, and embrace both the strengths and weaknesses of your body. The end result you hoped for often makes a surprise appearance when you least expect it. We all have different experiences, insecurities, enlightenments, and even some fears when beginning as a new yogi. Many realizations can surface as yoga becomes more of a daily and life practice. What matters most is to love your body and your mind, delight as you discover your own set of truths, and wholeheartedly accept and apply the wonderful changes that yoga brings to your life. by Julie Gondzar - Julie has been practicing yoga for just over a year, and lives in the beautiful state of Wyoming. 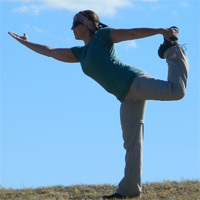 She's a part-time freelance writer with interests in health, wellness and the yoga lifestyle.